Tripteridia latistriga Warren comb. n.
Prosthetopteryx latistriga Warren, 1906, Novit. zool., 13: 125. 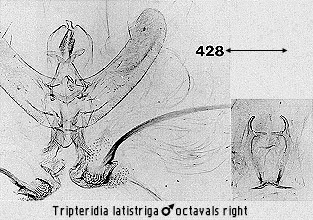 Micromia (Prosthetopteryx) latistriga cophogona Prout, 1932c: 63. Micromia latistriga Warren; Holloway, 1976: 67. Diagnosis. The very regularly angled yellow postmedial (almost submarginal) band on the forewing, together with the size of the moth, is diagnostic. The hindwings are pale straw colour, slightly fasciated in the female, though the male has a broad and diffuse zone of dark grey scaling associated with the subdorsal cleft. Geographical range. New Guinea; Borneo (ssp. cophogona). Habitat preference. All records are from G. Kinabalu, where the species occurs infrequently from 1800m to 2600m.